Megiddo (Hebrew: מגידו‎) is a hill in Israel. 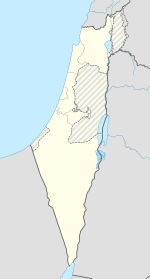 It is near the modern settlement of Megiddo, known for theological, historical and geographical reasons. In ancient times, Megiddo was an important city state. It is also known alternatively as Tel Megiddo (Hebrew) and Tell al-Mutesellim (Arabic). According to some interpretations of the Christian Bible, this will be the place for Armageddon (that derives from the name's place in Hebrew) or the final battle between the forces of light led by Jesus Christ and the forces of darkness led by Satan or the Anti-Christ after the "End of Days". Megiddo is a tel (hill or mound) made of 26 layers of the ruins of ancient cities in a strategic location at the head of a pass through the Carmel Ridge, which overlooks the Valley of Jezreel from the west. ↑ "Megiddo". BibArch. February 13, 2009. This page was last changed on 7 February 2018, at 14:51.